Argo is a 2012 American historical drama film directed by Ben Affleck and written by Chris Terrio. The film is adapted from U.S. Central Intelligence Agency operative Tony Mendez's book The Master of Disguise and Joshuah Bearman's 2007 Wired article "The Great Escape: How the CIA Used a Fake Sci-Fi Flick to Rescue Americans from Tehran." The latter deals with the "Canadian Caper," in which Mendez led the rescue of six U.S. diplomats from Tehran, Iran, during the 1979–1981 Iran hostage crisis. The film stars Affleck as Mendez with Bryan Cranston, Alan Arkin and John Goodman in supporting roles, and was released in the United States on October 12, 2012. The film was produced by Affleck, Grant Heslov and George Clooney. The story of this rescue was also told in the 1981 television movie Escape from Iran: The Canadian Caper, directed by Lamont Johnson. Upon release, Argo received widespread acclaim, with praise directed towards the acting (particularly Arkin), Affleck's direction, Terrio's screenplay, the editing and Desplat's score. The film received seven nominations at the 85th Academy Awards and won three, for Best Picture, Best Adapted Screenplay and Best Film Editing. The film also earned five Golden Globe Award nominations, winning Best Motion Picture – Drama and Best Director, while being nominated for Best Supporting Actor – Motion Picture for Alan Arkin. It won Outstanding Performance by a Cast in a Motion Picture at the 19th Screen Actors Guild Awards, with Arkin being nominated for Outstanding Performance by a Male Actor in a Supporting Role. It also won Best Film, Best Editing and Best Director at the 66th British Academy Film Awards and 37th Hochi Film Award for Best International Picture. Despite its praise, Argo has also been criticized for some specific inaccuracies: in particular for minimizing the role of the Canadian embassy in the rescue, for falsely showing that the Americans were turned away by the British and New Zealand embassies, and for exaggerating the danger that the group faced during events preceding their escape from the country. On November 4, 1979, Iranian activists storm the United States embassy in Tehran in retaliation for President Jimmy Carter giving the Shah asylum in the U.S. during the Iranian Revolution. 60 of the embassy staff are taken as hostages, but six avoid capture and hide in the home of Canadian ambassador Ken Taylor. With the escapees' situation kept secret, the U.S. State Department begins to explore options for exfiltrating them from Iran. Tony Mendez, a U.S. Central Intelligence Agency exfiltration specialist, is brought in for consultation. He criticizes the proposals, but is at a loss when asked for an alternative. While on the phone with his son, he is inspired by watching Battle for the Planet of the Apes and begins plans for creating a cover story for the escapees: that they are Canadian filmmakers who happened to be in Iran scouting exotic locations for a similar science-fiction film. Mendez contacts John Chambers, a Hollywood make-up artist who had previously crafted disguises for the CIA. Chambers puts Mendez in touch with film producer Lester Siegel. Together, they set up a phony film production company, publicize their plans, and successfully establish the pretense of developing Argo, a "science fantasy adventure" in the style of Star Wars, to lend credibility to the cover story. Meanwhile, the escapees grow frantic inside the ambassador's residence. The revolutionaries reassemble embassy photographs shredded before the takeover and learn that some personnel have escaped. Posing as a producer for Argo, Mendez enters Iran under the fake name Kevin Harkins and links up with the six escapees. He provides them with Canadian passports and fake identities to prepare them to get through security at the airport. Although afraid to trust Mendez's scheme, they reluctantly go along with it, knowing that he is risking his own life too. A scouting visit to the bazaar to maintain their cover story takes a bad turn, but their Iranian culture contact gets them away from the hostile crowd. Mendez is told that the operation has been cancelled to avoid conflicting with a planned military rescue of the hostages. He pushes ahead, forcing his boss Jack O'Donnell to hastily re-obtain authorization for the mission to get tickets on a Swissair flight. Tension rises at the airport, where the escapees' flight reservations are confirmed at the last minute, and a guard's call to the supposed production company in Hollywood is answered at the last second. The group boards the plane, which takes off just as the Revolutionary Guards at the airport uncover the ruse and try to stop them. To protect the hostages remaining in Tehran from retaliation, all U.S. involvement in the rescue is suppressed and full credit is given to the Canadian government and its ambassador (who left Iran with his wife under their own credentials as the operation was underway). The ambassador's Iranian housekeeper, who had known about the Americans and lied to the revolutionaries to protect them, escaped to Iraq. Mendez is awarded the Intelligence Star, but due to the mission's classified nature, he would not be able to officially receive the medal until the details were publicized in 1997. Actor, producer, and director Ben Affleck. Argo is based on the "Canadian Caper" that took place during the Iran hostage crisis in 1979 and 1980. Chris Terrio wrote the screenplay based on Joshuah Bearman's 2007 article in Wired: "How the CIA Used a Fake Sci-Fi Flick to Rescue Americans from Tehran." The article was written after the records were declassified. In 2007, the producers George Clooney, Grant Heslov and David Klawans set up a project based on the article. 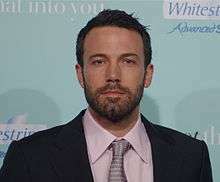 Affleck's participation was announced in February 2011. The following June, Alan Arkin was the first person cast in the film. After the rest of the roles were cast, filming began in Los Angeles in August 2011. Additional filming took place in McLean, Virginia; Washington, D.C.; and Istanbul. The scene in which Mendez drives up to and walks into the CIA headquarters lobby was filmed with permission at the CIA's original headquarters building in Virginia; all other scenes set at the CIA were filmed in the basement of the Los Angeles Times Building. As a historical piece, the film made use of archival news footage from ABC, CBS and NBC; and included popular songs from the era, such as "Little T&A" by The Rolling Stones (an anachronism, as it was not released until the following year), "Sultans of Swing" by Dire Straits, "Dance the Night Away" by Van Halen and "When the Levee Breaks" by Led Zeppelin. For its part, Warner Bros. used its 1972–1984 title featuring the "Big W" logo designed by Saul Bass for Warner Communications to open the film and painted on its studio lot's famed water tower the logo of The Burbank Studios (the facility's name during the 1970s and 1980s when Warner shared it with Columbia Pictures). The screenplay used by the CIA to create their cover story was an adaptation of Roger Zelazny's 1967 novel Lord of Light. Producer Barry Gellar had spearheaded an earlier attempt to produce the film with the book's original title. After that production attempt had failed, the screenplay was renamed Argo and used by the CIA. According to Tony Mendez, Studio Six—the phony Hollywood production office he helped create at the core of the CIA plan—proved so convincing that even weeks after the rescue was complete and the office had folded, 26 scripts were delivered to its address, including one from Steven Spielberg. A recent research of VICE Magazine based on the Freedom Of Information Act revealed in April 2016 that the CIA was also involved in the production of Argo (2012) itself, as it was in a number of American entertainment productions (such as the well-established case of the 2012 film Zero Dark Thirty). As of May 2016, the extent of this involvement is still classified and therefore largely unknown. The research, however, suggests not only simple assistance for greater authenticity of the film was given but rather recommendations on how to depict the historical events and its involved entities - a known CIA practice. All tracks written by Alexandre Desplat, except where noted. First Lady Michelle Obama announces the winner of Academy Award for Best Picture, Argo, live from the Diplomatic Room of the White House, February 24, 2013. Argo was acclaimed by critics, praising Ben Affleck's direction, the cast (especially Arkin and Goodman), the script and the editing. Rotten Tomatoes gives the film an approval rating of 96%, based on 306 reviews, with an average rating of 8.4/10. The site's critical consensus reads, "Tense, exciting and often darkly comic, Argo recreates a historical event with vivid attention to detail and finely wrought characters." On Metacritic, the film has a score of 86 out of 100, based on 45 critics, indicating "universal acclaim". CinemaScore reported that audiences gave the film a rare "A+" grade. Naming Argo one of the best 11 films of 2012, critic Stephen Holden of The New York Times wrote: "Ben Affleck's seamless direction catapults him to the forefront of Hollywood filmmakers turning out thoughtful entertainment." The Washington Times said it felt "like a movie from an earlier era — less frenetic, less showy, more focused on narrative than sensation," but that the script included "too many characters that he doesn’t quite develop." The craft in this film is rare. It is so easy to manufacture a thriller from chases and gunfire, and so very hard to fine-tune it out of exquisite timing and a plot that's so clear to us we wonder why it isn't obvious to the Iranians. After all, who in their right mind would believe a space opera was being filmed in Iran during the hostage crisis? Ebert gave the film 4/4 stars, calling it "spellbinding" and "surprisingly funny," and chose it as the best film of the year, the last film he would choose for this honor before his death in 2013. Literary critic Stanley Fish says that the film is a standard caper film in which "some improbable task has to be pulled off by a combination of ingenuity, training, deception and luck." He goes on to describe the film's structure: "(1) the presentation of the scheme to reluctant and unimaginative superiors, (2) the transformation of a ragtag bunch of ne'er-do-wells and wackos into a coherent, coordinated unit and (3) the carrying out of the task." This is one of those movies that depend on your not thinking much about it; for as soon as you reflect on what's happening rather than being swept up in the narrative flow, there doesn't seem much to it aside from the skill with which suspense is maintained despite the fact that you know in advance how it's going to turn out. ... Once the deed is successfully done, there's really nothing much to say, and anything that is said seems contrived. That is the virtue of an entertainment like this; it doesn't linger in the memory and provoke afterthoughts. Abolhassan Banisadr, foreign minister and then president during the incident, argued that the movie does not take into account the fact that most of the cabinet members advocated freeing all the American personnel quickly. Jian Ghomeshi, a Canadian writer and radio figure of Iranian descent, thought the film had a "deeply troubling portrayal of the Iranian people." Ghomeshi asserted "among all the rave reviews, virtually no one in the mainstream media has called out [the] unbalanced depiction of an entire ethnic national group, and the broader implications of the portrait." He also suggested that the timing of the film was poor, as American and Iranian political relations were at a low point. University of Michigan history professor Juan Cole had a similar assessment, writing that the film's narrative fails to provide adequate historical context for the events it portrays, and such errors of omission lead all of the Iranian characters in the film to be depicted as ethnic stereotypes. A November 3, 2012 article in the Los Angeles Times claimed that the film had received very little attention in Tehran, though Masoumeh Ebtekar, who was the spokesperson of the students who took the hostages and called only "Tehran Mary" in the film's credits, said that the film did not show "the real reasons behind the event." Bootleg DVDs have become popular and are estimated at "several hundreds of thousands" of copies. Interpretations of the film's popularity in Iran have varied, ranging from the fact that the movie portrays the excesses of the revolution and the hostage crisis, which had been long glorified in Iran, to regular Iranians viewing it as a somber reminder of what caused the poor relations with America and the ensuing cost to Iran, decades after the embassy takeover. The high DVD sales are suggested as a form of silent protest against the government's ongoing hostility to relations with America. The film earned $136,024,128 in North America, and $96,300,000 in other countries, for a worldwide total of $232,324,128. The film was released in North America on February 19, 2013 on DVD, Blu-ray Disc and with an UltraViolet digital copy. The film was nominated for seven Academy Awards and won three, for Best Picture, Best Adapted Screenplay and Best Film Editing. Affleck was not nominated for Best Director, and following the announcement of the nominations, Bradley Cooper, who was nominated for his leading performance in Silver Linings Playbook, declared: "Ben Affleck got robbed." This opinion was shared by the ceremony's host Seth MacFarlane and Quentin Tarantino, whose film Django Unchained was nominated in several categories. Standing in the Golden Globe pressroom with his directing trophy, Affleck acknowledged that it was frustrating not to get an Oscar nod when many felt he deserved one. But he's keeping a sense of humor. "I mean, I also didn't get the acting nomination," he pointed out. "And no one's saying I got snubbed there!" After the film was previewed at the 2012 Toronto International Film Festival, many critics said that it unfairly glorified the CIA's role and minimized the Canadian government's role (particularly that of Ambassador Taylor) in the extraction operation. Maclean's asserted that "the movie rewrites history at Canada's expense, making Hollywood and the CIA the saga's heroic saviours while Taylor is demoted to a kindly concierge." The postscript text said that the CIA let Taylor take the credit for political purposes, which some critics thought implied that he did not deserve the accolades he received. In response to this criticism, Affleck changed the postscript text to read: "The involvement of the CIA complemented efforts of the Canadian embassy to free the six held in Tehran. To this day the story stands as an enduring model of international co-operation between governments." The Toronto Star wrote, "Even that hardly does Canada justice." 90% of the contributions to the ideas and the consummation of the plan was Canadian. And the movie gives almost full credit to the American CIA. And with that exception, the movie is very good. But Ben Affleck's character in the film was... only in Tehran a day and a half. And the main hero, in my opinion, was Ken Taylor, who was the Canadian ambassador who orchestrated the entire process. Taylor noted, "In reality, Canada was responsible for the six and the CIA was a junior partner. But I realize this is a movie and you have to keep the audience on the edge of their seats." In the film, Taylor is shown threatening to close the Canadian embassy. This did not happen, and the Canadians never considered abandoning the six Americans who had taken refuge under their protection. Because we say it's based on a true story, rather than this is a true story, we're allowed to take some dramatic license. There's a spirit of truth .... the kinds of things that are really important to be true are—for example, the relationship between the U.S. and Canada. The U.S. stood up collectively as a nation and said, "We like you, we appreciate you, we respect you, and we're in your debt."... There were folks who didn't want to stick their necks out and the Canadians did. They said, "We'll risk our diplomatic standing, our lives, by harbouring six Americans because it's the right thing to do." Because of that, their lives were saved." Upon its release in October 2012, the film was criticized for its suggestion that British and New Zealand embassies had turned away the American refugees in Tehran. Neither the British nor the New Zealand embassies had turned the refugees away. Both embassies, along with the Canadians, helped them. The British took immense risks, having initially hosted the American refugees. However, the location was deemed unsafe as the British embassy itself had been targeted and surrounded by mobs and all involved officials from the various nations believed the Canadian ambassador's residence to be a safer location. New Zealand diplomatic ambassadors also took huge risks: organizing a place for the refugees to hide if they needed to change their location, and driving the Americans to the airport when they made their escape from Tehran. British diplomats also assisted other American hostages beyond the escaped group of six. Bob Anders, the U.S. consular agent played in the film by Tate Donovan, said, "They put their lives on the line for us. We were all at risk. I hope no one in Britain will be offended by what's said in the film. The British were good to us and we're forever grateful." My immediate reaction on hearing about this was one of outrage. I have since simmered down, but am still very distressed that the film-makers should have got it so wrong. My concern is that the inaccurate account should not enter the mythology of the events in Tehran in November 1979." The then-British chargé d'affaires in Tehran said that, had the Americans been discovered in the British embassy, "I can assure you we'd all have been for the high jump." Martin Williams, secretary to Sir John Graham in Iran at the time, was the one who found the Americans, after searching for them in his own British car (the only Austin Maxi in Iran) and first sheltered them in his own house. The sequence in the film when a housekeeper confronts a truckload of Iranian revolutionary guards at the Canadian ambassador's home bears a striking resemblance to Williams' story. He has told how a brave guard, Iskander Khan, confronted heavily armed revolutionary guards and convinced them that no-one was in when they tried to search Williams' house during a blackout. Williams said, "They went away. We and the Americans had a very lucky escape." The fugitives later moved to the residence of the Canadian ambassador. Affleck is quoted as saying to The Sunday Telegraph: "I struggled with this long and hard, because it casts Britain and New Zealand in a way that is not totally fair. But I was setting up a situation where you needed to get a sense that these six people had nowhere else to go. It does not mean to diminish anyone." ... this House acknowledge[s] with gratitude the efforts of former New Zealand diplomats Chris Beeby and Richard Sewell in assisting American hostages in Tehran during the hostage crisis in 1979, and express[es] its regret that the director of the movie Argo saw fit to mislead the world about what actually happened during that crisis when, in reality, our courageous diplomats’ inspirational actions were of significant help to the American hostages and deserve the factual and historical record to be corrected. In the film, the diplomats face suspicious glances from Iranians whenever they go out in public, and appear close to being caught at many steps along the way to their freedom. In reality, the diplomats never appeared to be in imminent danger. Rather than the team having to withstand scrutiny while buying tickets, Taylor's wife bought three sets of plane tickets from three different airlines ahead of time, without any issues. The film depicts a dramatic last-minute cancellation of the mission by the Carter administration and Mendez declaring he will proceed with the mission. Carter delayed authorization by only 30 minutes, and that was before Mendez had left Europe for Iran. The film portrays a tense situation when the crew tries to board the plane, and their identities are nearly discovered. No such confrontation with security officials took place at the departure gate. The film has a dramatic chase sequence as the plane takes off; this did not occur. As Mark Lijek described it, "Fortunately for us, there were very few Revolutionary Guards in the area. It is why we turned up for a flight at 5.30 in the morning; even they weren't zealous enough to be there that early. The truth is the immigration officers barely looked at us and we were processed out in the regular way. We got on the flight to Zurich and then we were taken to the US ambassador's residence in Bern. It was that straightforward." The screenplay has the escapers—Mark and Cora Lijek, Bob Anders, Lee Schatz, and Joe and Kathy Stafford—settling down to enforced cohabitation at the residence of the Canadian ambassador Ken Taylor. In reality, after several nights, the group was split between the Taylor house and the home of another Canadian official, John Sheardown. "It's not true we could never go outside. John Sheardown's house had an interior courtyard with a garden and we could walk there freely," Mark Lijek says. Lester Siegel, played by Alan Arkin, is not a real person. His name and some contribution are based on Robert Sidell's while his personality is based on Jack Warner's. In the depiction of a frantic effort by CIA headquarters, in Langley, to get President Jimmy Carter to re-authorize the mission so that previously purchased airline tickets would still be valid, a CIA officer is portrayed as getting the White House telephone operator to connect him to Chief of Staff Hamilton Jordan by impersonating a representative of the school attended by Jordan's children. In reality, Jordan was unmarried and had no children at the time. The film depicts Mendez discovering the script with the title of Argo. In reality the script was titled Lord of Light, based on the book of the same name by Roger Zelazny. The CIA changed the title to Argo. Comic book artist Jack Kirby did not do his storyboard work for the fabricated CIA film production. He created these when there was an attempt to produce Lord of Light a few years before the Iranian hostage situation. The Hollywood Sign is shown dilapidated as it had been in the 1970s. The sign had been repaired in 1978, two years prior to the events described in the film. There is a modern-day flag of the Democratic Republic of the Congo visible in one of the windows of the CIA headquarters building. In 1979/1980 the country was known as Zaire and flew a completely different flag. The Swissair flight that took Mendez and the hostage group out of Tehran is shown operated with a Boeing 747-300, a type which entered service in 1983, and is painted in a livery that Swissair introduced in 1980. In real life, the group departed Iran on a Swissair Douglas DC-8. The aircraft shown in the film has a fictional registration of HB-ISO, which actually belongs to a Swissair McDonnell Douglas DC-9-51. On Wings of Eagles, a 1983 novel by Ken Follett about Ross Perot's successful rescue of several of his employees from Iran just after the revolution. ↑ "Argo". British Board of Film Classification. June 29, 2012. Retrieved September 18, 2012. 1 2 3 "Argo (2012)". Box Office Mojo. Retrieved April 27, 2013. 1 2 3 4 5 6 Bearman, Joshuah (April 24, 2007). "How the CIA Used a Fake Sci-Fi Flick to Rescue Americans from Tehran". Wired. ↑ Killoran, Ellen (October 13, 2012). "'Argo' Review: Ben Affleck Pinches Himself In Stranger-Than-Fiction CIA Story". International Business Times. Retrieved 25 February 2013. ↑ "escape-from-iran-the-canadian-caper-1981-true-story-dvd-94c7%255B2%255D.jpg (image)". Lh4.ggpht. Retrieved October 29, 2012. ↑ "Scenes from 'Argo' shot in 'Los Angeles'". filmapia. Retrieved February 25, 2013. ↑ "Affleck starts shooting 'Argo' film in LA". United Press International. September 12, 2011. ↑ Egan, Jack (18 December 2012). "Contender – Director of Photography Rodrigo Prieto, Argo". Below the Line. Retrieved 4 January 2015. ↑ Haithman, Diane (December 31, 2012). "OSCARS: Re-Creating The Look Of The '70s For 'Argo'". Deadline.com. 1 2 3 Higgins, Bill; Kit, Borys. "Argo's odd Hollywood history." Hollywood Reporter. October 5, 2012: 64. eLibrary. March 1, 2013. ↑ Lane, Anthony (October 15, 2012). "Film Within A Film". The New Yorker: 99. Retrieved 17 July 2013. ↑ "Argo". Rotten Tomatoes. Retrieved November 17, 2012. 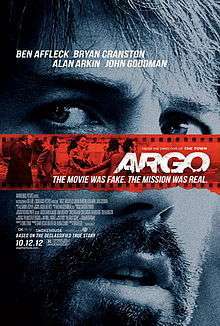 ↑ "Argo Reviews". Metacritic. Retrieved October 10, 2012. ↑ Holden, Stephen (December 14, 2012). "The Year of the Body Vulnerable". The New York Times. Retrieved December 14, 2012. 1 2 Ebert, Roger (10 October 2012). Argo. Chicago Sun-Times. Retrieved January 16, 2013. 1 2 Fish, Stanley (October 29, 2012). "The 'Argo' Caper". The New York Times. Retrieved January 4, 2013. ↑ Parry, Robert (March 7, 2013). "'October Surprise' and 'Argo'". Consortium News. Retrieved July 30, 2013. ↑ Ghomeshi, Jian (November 2, 2012). "Argo is crowd-pleasing, entertaining – and unfair to Iranians". Globe and Mail. Retrieved November 5, 2012. ↑ Cole, Juan (January 26, 2013). ""Argo" as Orientalism and why it Upsets Iranians". Informed Comment. Retrieved February 26, 2013. ↑ Mostaghim, Ramin; Alexandra Sandels (November 3, 2012). "U.S. film 'Argo' not getting any buzz in Iran". Los Angeles Times. Retrieved 9 January 2013. 1 2 Kamali, Saeed (November 13, 2012). "Why Argo is hard for Iranians to watch". The Guardian. Retrieved February 25, 2013. ↑ Weisman, Aly (February 1, 2013). "Outlawed 'Argo' DVDs are selling by the thousands in Iran". Globalpost.com. GlobalPost. Retrieved August 17, 2015. ↑ "Argo Blu-Ray". Blu-Ray. Retrieved January 17, 2013. ↑ Carneiro, Bianca (January 10, 2013). "'Ben Affleck was robbed': Best actor nominee Bradley Cooper on Argo star's Oscars snub". Daily Mail. Retrieved January 10, 2013. ↑ Macatee, Rebecca (January 10, 2013). "Ben Affleck's Oscars Snub: Bradley Cooper, Seth MacFarlane Think Argo Director Was Robbed". E! Online. NBCUniversal. Retrieved January 10, 2013. ↑ "Quentin Tarantino thinks Ben Affleck's Oscar snub was worse than his". NDTV Movies. February 18, 2013. Retrieved February 25, 2013. ↑ "The Oscars / 2013: Eyes on the Prize". Entertainment Weekly. New York: Time Inc.: 22 January 25 – February 1, 2013. ↑ "Argo: Iran hostage crisis film fiddles with the facts | CTV British Columbia News". Bc.ctvnews.ca. Retrieved 2013-08-01. 1 2 3 4 Johnson, Brian D. (September 12, 2012). "Ben Affleck rewrites history". Macleans. Retrieved September 19, 2012. ↑ Knelman, Martin (September 13, 2012). "TIFF 2012: How Canadian hero Ken Taylor was snubbed by Argo". Toronto Star. Archived from the original on October 16, 2012. Retrieved September 19, 2012. 1 2 3 4 5 Knelman, Martin (September 19, 2012). "Ken Taylor's Hollywood ending: Affleck alters postscript to 'Argo'". Toronto Star. Retrieved September 19, 2012. ↑ Coyle, Jim (October 7, 2012). "'Argo': Former ambassador Ken Taylor sets the record straight". Toronto Star. Retrieved November 1, 2012. ↑ McDevitt, Caitlin (February 22, 2013). "Jimmy Carter: 'Argo' great but inaccurate". Politico. Retrieved February 22, 2013. ↑ "Ben Affleck's Argo UK Diplomats Deny Movie Slur". The Mail. 26 February 2013. Retrieved 5 April 2016. ↑ "Opinion: Ben Affleck must apologise to NZ for Argo's deception". 3 News NZ. February 27, 2013. ↑ "NZ's role in Iran crisis tainted in Affleck's film 'Argo' – Story – Entertainment". 3 News. Retrieved October 29, 2012. ↑ Film. "Ben Affleck's new film 'Argo' upsets British diplomats who helped Americans in Iran". Telegraph. Retrieved October 29, 2012. 1 2 3 4 Barrett and Jacqui Goddard, David (October 20, 2012). "Ben Affleck's new film 'Argo' upsets British diplomats who helped Americans in Iran". The Telegraph. Retrieved October 21, 2012. 1 2 Martin Williams (March 2, 2013). "I rescued Argo hostages in my orange Austin Maxi... it had a GB sticker on! Hit film lauds American heroes and claims Brits refused to help, but our man in Iran reveals the real story". Daily Mail. ↑ "Motions—Iran Hostage Crisis—Fictional Representation of Role of New Zealand Diplomats". Hansard Office, New Zealand Parliament. March 12, 2013. Retrieved March 13, 2012. ↑ "Movie Argo 'misled the world'". Herald Sun. March 12, 2013. Retrieved March 12, 2013. 1 2 3 4 Dowd, Vincent (January 14, 2013). "Argo: The true story behind Ben Affleck's Globe-winning film". BBC. Retrieved February 25, 2013. 1 2 Mendez, Antonio J. (Winter 1999–2000). "CIA Goes Hollywood: A Classic Case of Deception". Studies in Intelligence. Central Intelligence Agency. Retrieved November 1, 2010. ↑ Yukon Damov (November 16, 2012). "Diplomats in Iranian hostage crisis discuss Argo: Spoiler alert: Hollywood fudged the facts". The Newspaper. Archived from the original on February 8, 2015. Wednesday night’s conversation between former diplomats Robert Anders and Michael Shenstone, hosted by the U.S. Consulate and the University of Toronto International Relations Society, was an exercise in displaying Hollywood’s manipulation of historical reality. ↑ 19 Photos (October 10, 2012). "Tony Mendez, clandestine CIA hero of Ben Affleck's 'Argo,' reveals the real story behind film smash". Washington Times. Retrieved October 29, 2012. ↑ Martin, Douglas (January 4, 2013). "John Sheardown, Canadian Who Sheltered Americans in Tehran, Dies at 88". New York Times. Retrieved February 24, 2013. ↑ "How accurate is Argo". Slate. Retrieved November 15, 2012. ↑ Dowd, Maureen (February 16, 2013). "The Oscar for Best Fabrication". New York Times. Retrieved February 25, 2013. ↑ 1978: A Sign Is Reborn. The Hollywood Sign. Retrieved on 2014-05-22. ↑ Patrick Smith (March 1, 2013). ""Argo" and the 747". Askthepilot.com. Retrieved August 17, 2015. "Why Argo is hard for Iranians to watch", The Guardian, 13 November 2012.